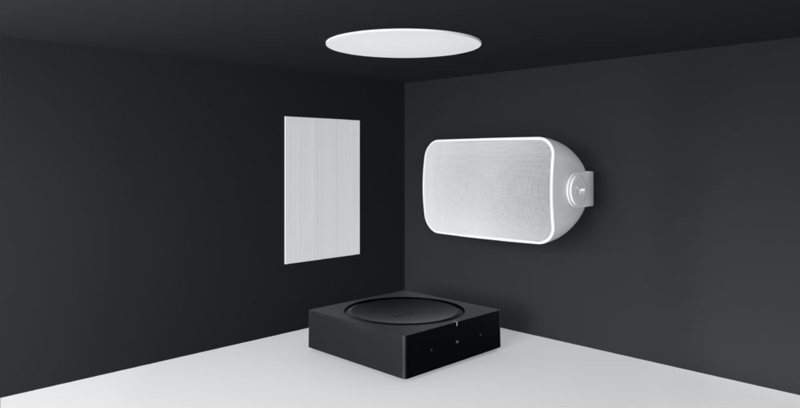 Speaker colossus Sonos and audio manufacturer Sonance have joined forces to create a new line of in-wall, in-ceiling, and weatherproof outdoor speakers designed to work with the Sonos Amp. The new line, called Sonos Architectural, promises to bring built-in music streaming to your entire home, whether you’re doing chores around your home or relaxing in the garden. It’s the first time Sonance has created a speaker solely for Sonos, whose CEO Patrick Spence explained that “our goal was to create a solution optimized for installers, bringing the Sonos experience to architectural speakers for the first time. The outdoor speaker is designed to be weatherproof, so it should be fine to use in both the height of summer and the bleakest depths of winter; Sonos says it’s “engineered to withstand humidity, water, salt spray, heat, UV rays, and freezing temperatures”. The in-wall and in-ceiling speakers from the new range are built to blend in with your home, and feature grilles that can even be painted to make them fully disappear into their surroundings. If you want to fully deck out your home, you can connect up to three pairs of Sonos Architectural speakers to your Sonos Amp, and use AirPlay 2, Spotify, Apple Music, Tidal, Youtube Music, and other compatible streaming services to play your music. Just as with one of Sonos’ regular speakers, you’ll also be able to tune the Sonos Architectural range to your room using the Sonos App, for a bespoke listening experience. The outdoor speaker costs $799 (£799 / AU$1199) for a set of two, while a pair of either the in-ceiling or in-wall speakers costs $599 (£599 / AU$899). In other Sonos news, the audio giant has announced that its long awaited Sonos Amp is now available to buy in the US, Australia, Canada, and Mexico. It’s also now available to preorder in Europe, with shipping due to commence on February 12. Costing $599 (£599 / AU$999), the Sonos Amp has twice the power of the old Connect Amp, and can stream music, connect up to four speakers to the Sonos app, and even control your TV. So, if you want to build your speaker system into your home it won’t be cheap – but it will probably make you feel very flash indeed.